1. Lord Leonard Troughear HOLMES, son of Thomas TROUGHEAR D.D. (1681-1762) and Elizabeth HOLMES (1696-1788), was born on 24 May 1731. He had the title 'Baron (in the Irish Peerage)'. He was a Clergyman. He married Elizabeth TYRRELLL circa 1759. He died on 18 January 1804 in Newport, Isle of Wight. 2. Thomas TROUGHEAR D.D. was born on 6 September 1681. He was a Vicar of Carrisbrooke with Northwood. He married Elizabeth HOLMES in 1724 in Thorley, Isle of Wight. He died in 1762. 4. Henry HOLMES of Yarmouth, Isle of Wight, son of Colonel Thomas HOLMES of Kilmallock, co. Limerick and Anne GIBBONS, was born circa 1660. He was a Lieutenant-governor of the Isle of Wight. He married Mary HOLMES. He died on 18 June 1738. He was buried on 23 June 1738 in Yarmouth, Isle of Wight. He was the son of Thomas Holmes of Kilmallock, co. Limerick and became a major in the Army. He was appointed Captain of Hurst Castle on the Isle of Wight from 1683 to 1714. He was a Member of Parliament for Yarmouth (Isle of Wight), England from April 1695 until 1717. He quarreled in the House of Commons with John Cutts, 1st Baron Cutts in 1697, accusing Cutts of discharging militia officers in Yarmouth, Isle of Wight who had voted against Holmes' rival, Cutts' brother-in-law John Acton. He was also Lieutenant-Governor of the Isle of Wight from 1710 to 1714. He married Mary, the illegitimate daughter of Sir Robert Holmes, MP of Thorley, and with her had 8 sons and 8 daughters. 5. Mary HOLMES, daughter of Sir Robert HOLMES Bart., was born circa 1678. She died in [Julian] March 1760 in Yarmouth. She was buried on 7 March 1760 in Yarmouth. Mary was an illegitimate child, her father never having married. She was the latter's only child. As had been her father's wish, she married Henry Holmes, the son of his elder brother Colonel Thomas Holmes of Kilmallock, Co. Limerick. Thomas HOLMES (1699-1764). 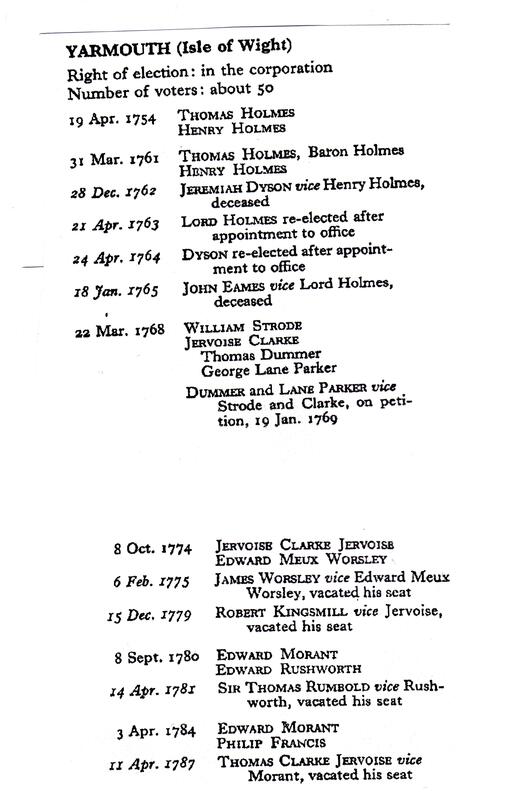 Thomas was born in 1699 in Yarmouth. He was christened on [Julian] 2 November 1699. He was a Governor of the Isle of Wight. He had the title '1st Baron Holmes of Kilmallock'. He married Anne PLAYER in 1727. He died in [Julian] July 1764. He was buried on [Julian] 21 July 1764 in Yarmouth.